When Barks turned from the hectic cartoons to the more sedate comics he quickly realized that just putting one sight gag on top of the next was not a solution: Those sight gags are quite limited. You know, there are only so many things you can do with a human body or a duck body and then you start repeating yourself, otherwise you'd kill him. Barks also quickly realized that the ducks as they were known from the many animated shorts, would not stand a chance in his comics. The pace in a comic story had to be much more mellow and the stories had to carry considerably more weight. Thus he changed Donald from an annoying and brainless 'goose' to a multifaceted personality. He also transformed the nephews from naughty scamps into reflective and rational characters. Almost all of Barks' characters were given specific personalities which developed through the years. I bought a large bulletin board, and when I'd get a half sheet or a comic page done in pencil, I'd stick it up there, and then the next one, and the next one, and after I got about five of them done, I would sit back and look at the display and read the continuity. Sometimes I would take down two or three sheets and do a lot of erasing and changing. I was able to visualize my story progress much better that way. Later, I finally got so polished at writing those stories that I didn't need to work by that method. I could just do a half page and stick it up on the shelf. I was able to visualize it more or less from my longhand, rather than having to have it up there in pencil drawings. But I think that my best work was done back in those years, when I had, say, five pages all laid out in blue pencil to criticize. I was never able to just sit down and write a longhand script. First, I jotted down a bunch of gags that would come to my mind. Then I would start hooking the gags together, and pretty soon I'd have a sort of a little synopsis. From that, I'd break it down into a longer synopsis. Make a mark every two or three lines and think, 'Well, that will make one page', and 'This'll make another page'. By the time I'd get to the bottom of my synopsis, I'd know whether I was going to have enough material. I took a piece of paper and drew a few funny situations on it, just ideas that I had. What should I have the ducks do today? When I had enough individual gags, I'd make a short summary and develop the entire story, as a whole. That was one difference between me and the other artists and writers. I took individual gags, tightened them up and built the highpoint of the story out of them, and then I went back - how could the ducks get into such a situation? I always proceeded very logically, and the individual logical steps were made as funny as possible. In 1975 fan Harry Blackstone consulted Barks on how to write a comic book story. Barks sent him a rough (left) advising him to present a story in a quickly readable way in order to get the reader's attention. Follow format of title pages for first page of script. Then rough out other pages in 6, 7, or 8 panel breakdowns. - Huey, Dewey, Louie come here quick! A herd of lions are in our poppy patch! - Snarl - Lions! - Unca Donald has been smoking those poppies again! - Never mind, kids! Just run for your lives! I don't know exactly why I did so much research for my stories, but I had the feeling the ducks had to go to real places. Otherwise the stories would look silly. I know in the other duck stories in the comics they went to islands like Booga Booga or something like that, places that didn't have any relation to reality. 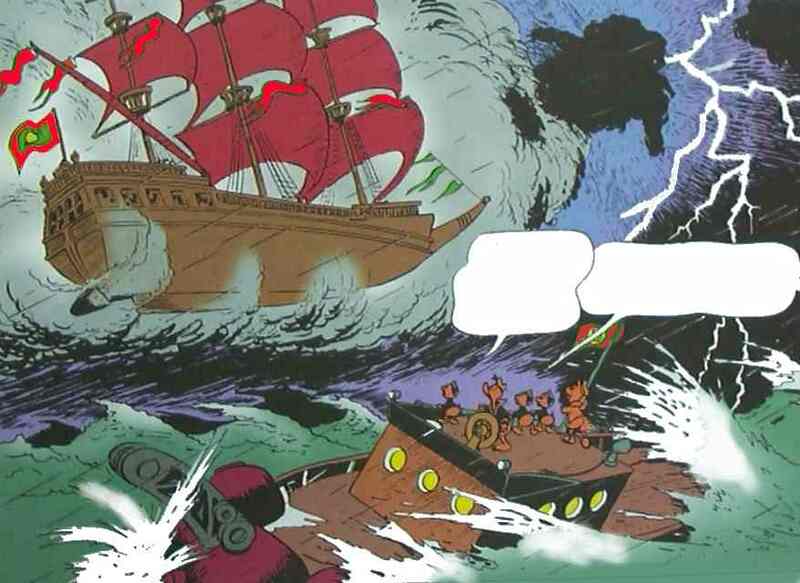 And they made their drawings in little squiggly backgrounds that didn't have the right character, for example the South Seas. When I sent the ducks to an island in the South Seas, I gave it a name that sounded very much like it could actually be on the map. And I would go and look at pictures of plants there, and islands and mountains, and all the rest, and I made my background look like the ducks went to just such a place (Barks primarily used National Geographic and Encyclopedia Britannica as his sources - Editor's remark). Sometimes Barks literally dreamt up his best ideas. This resulted in him keeping a pencil and pad on his bedside table. Many a night his wife Garé was awakened as he would suddenly sit up in bed to scribble down an idea. I woke up one night thinking: Petroglyphica! The name stuck, and when I got out of bed the next morning, I could still remember it. I don't know, these crazy names just come to me in the night. Another of Barks' strengths as a storyteller was his vivid imagination regarding his characters' names. He dreamt up precise and descriptive names as no one else could. Here are ten quick examples: Rockjaw Bumrisk (WDCS145), Whan Beeg Rhat (U$64), Snake McViper (U$69), Applecheeks Teengiggle (WDCS209), Angina Arthritis (WDCS090), Brainerd Brainmore (U$57), Porkmuscle J. Hamfat (WDCS179), Longhorn Tallgrass (U$23), Trestleman Truckhorse (WDCS188), Mrs. J. Crowsfoot Dryskin of Turtleneck-On-The-Mohawk (WDCS308). Brush inking by Eustace B. Sloppy. Any time that I wrote a script, when I got through with it, I'd lay it aside, pick it up the next morning, and read it. If it didn't read with a lot of rhythm going right on through, I'd work on it another day or so until I got to where it sounded good, then start drawing. With the drawing, too, I would pick up sheets that I had done two or three days before and look at them. If the business didn't look right, I didn't mind doing it over. I was after a certain quality. In fact I laid it right on the line. There was no difference between my characters and the life my readers were going to have to face. When the Ducks went out in the desert, so did Joe Blow down the street with his kids. When Donald got buffeted around, I tried to put it over in such a way that kids would see it could happen to them. Unlike the superhero comics, my comics had parallels in human experience. Barks distinguished quite firmly between his ten-pagers and the long adventure stories when it came to the basic plots. In the ten-pagers the action was more vivid - and often more violent - and most circled around different parent-children relationships, where Donald and the nephews took 'turns' in being the underdogs. In the adventure stories the action was much more epically founded - more laid back - with time to develop and show long and sometimes complicated plots. Donald and the nephews were often equals helping each other instead of terrorizing each other. 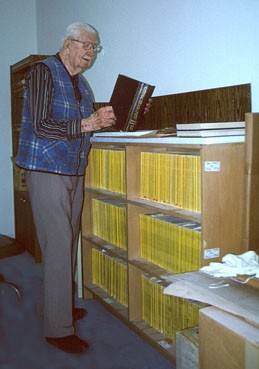 Barks spent countless hours polishing the scripts in a way that would bring the story forward. The speech balloons received the same attention. Some times I even had to count the words to compress them to the format of the bubbles. He quickly understood the folly in letting the characters express what was already obvious from the pictures, and this fact may be a contributing reason that his stories moved along so smoothly. The choice of words also was one of Barks' passions. I'll rather use one word instead of four, he once stated, and consequently he polished and re-polished his material to perfection. I tried to make it as brief as possible. If I could find a word that would express what four words say, I would use that one word. So I had a sort of short, very crisp dialogue in my stories as a result of that contracting them down. And, in order to get the dialogue as short as possible, sometimes it was necessary to even count the syllables, and I would do that if it got down to it, and that also helped to create an even flow, so that it was almost like prose poetry the way the ducks voices would come in. Barks would spend much more time on his stories and panels than any other Disney artist at the time. Generations of kids have learned a great deal about real historical and mythological events from Barks' story, because Barks usually took time to research his stories properly. How many of today's kids would have even heard of the Flying Dutchman (U$25 The Flying Dutchman), the fountain of youth (U$32 That's No Fable), the Philosopher's Stone (U$10 The Fabulous Philosopher's Stone), ancient European Gods (U$34 Mythic Mystery), or the golden fleece (U$12 The Golden Fleecing) if they had not read Barks' stories? Furthermore, he rewrote every single story a number of times until he himself was satisfied with its 'flow'. 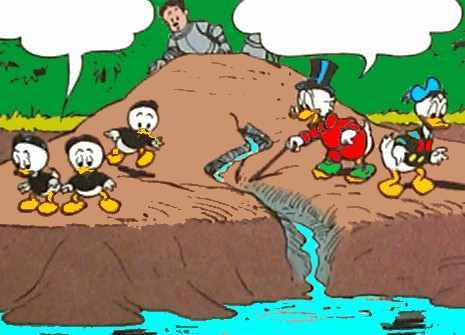 He also took the trouble to add much more background effects into his panels; just think of all the hilarious examples with odd pictures and aquariums in Donald's home and the strange vehicles encountered in the streets of Duckburg. I tried to end each page, especially toward the latter part of the story, with a little zinger that would carry the reader forward. Sometimes the story would not lend itself to that kind of presentation, but that's the way we learned it at the Disney Studios working on the short subjects. There had to be a little climax just about every few seconds on the screen, so that's the way I tried to write the duck stories. I was letting the story build up to a certain point in which the reader would be expecting the conventional end, and then I would fool the reader by dragging in something that was completely ridiculous, making it look plausible. You've got to be darn sure that your idea is presented. If it's going to take three or four drawings to present that idea, the timing of it comes in on how much development you do in the first panel, how much you do in the second, how much in the third, and if you keep the development just enough that the reader can figure out what is coming, and then in the fourth panel, give it to him with a big sock right in the face. That's what I consider timing. There have been times when I felt nervous about taking a chance with a plot, but it wasn't enough to stop me. I'd compromise a bit if I felt I was getting too wild. I've approached every subject with my teeth chattering and knees knocking. Getting new ideas was the big nerve-racker. Often I'd feel I'd pumped the well dry and hadn't another idea in my system - I'd get real scared. I can remember times when I got so scared that when I did come up with an idea, I almost cried with relief at having gotten over that hump again. Writing was a mental strain. Once I had gotten the general idea, then that was a moment of joy ... It wasn't genius or even unusual talent that made the stories good, it was patience and a large wastebasket. Ideas generally come in a very complicated form, and you've got to strip them down to make them useable. Boil a gag down to its simplest form and it is readily discernible to anybody who sees it. Don't try to use too many ideas in a story plot. You have to be selective. Be mean. Throw perfectly lovely gags in the waste basket.